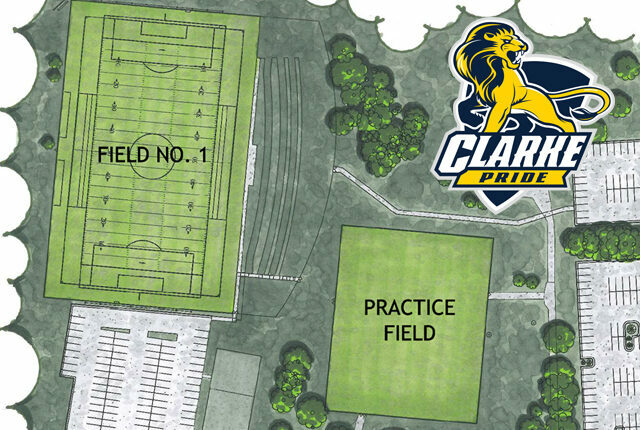 Clarke University Athletic Director Curt Long announced that construction is underway on a $4 million dollar project for athletic facilities on Clarke’s campus. The project includes turfing the existing soccer and lacrosse field, creating a turfed practice field adjacent to the main field, adding a weight room, fitness area, and locker rooms on the ground floor of the Robert and Ruth Kehl Center, and building storage areas and a press box for the soccer and lacrosse field. The project has an August 1, 2018 completion date. The game field will be marked for soccer, lacrosse, and football and will have football goal posts. The game field will measure 70 yards wide by 120 yards long with a 15-foot run off turf area surrounding the field. The practice field is 70 yards by 60 yards. Both fields will have LED lighting and will be enclosed by fencing with netting in some areas. The hillside overlooking the existing soccer and lacrosse field will be terraced to provide seating areas for spectators. Football games will be played at Dalzell Field at Dubuque Senior High School. The locker rooms on the ground floor of the Kehl Center will serve the soccer and lacrosse teams and the football team. The fields are designed by Straka-Johnson Architects and Conlon Construction is the general contractor. FEH Associates is the project architect for the locker rooms and weight room, with Sheets Design Build as the general contractor. Site preparation began on February 15. Clarke’s men’s and women’s lacrosse teams have played their home games this spring at Loras College and at the University of Dubuque. Clarke University is a member of the National Association of Intercollegiate Athletics (NAIA) and the Heart of America Athletic Conference. Clarke offers 21 intercollegiate sports.